(Nanowerk Spotlight) Currently, optically absorbing nanoparticles are breaking into clinical medicine because of their ability to aid in the identification of disease with several medical imaging modalities. These nanoparticles are also used in therapeutics by triggering drug release or enhancing ablation of diseased tissues, while minimizing damage to healthy tissues. The efficiency and effectiveness of the medical imaging and therapeutics using nanoparticles depends on the ability to selectively target them to the specific tissues. Researchers' attempts to quantify nanoparticles using photoacoustic imaging fell short because their techniques relied on the knowledge of the of the optical properties of the tissues to estimate the amount of light that reached the nanoparticles. Determining the optical properties has proven to be very difficult because every tissue under question behaves differently. Unlike optical microscopy techniques – confocal, bright-field, and dark-field microscopy – where generally both the optical absorption and scattering contribute to the signal, the signal in photoacoustic microscopy is based solely on the optical absorption because it is acoustic waves, which have longer wavelengths, that are being detected. A novel method, developed by researchers at the University of Texas at Austin, only uses properties of the nanoparticles – which are easily determined from the stock nanoparticle solution – and therefore are independent of the amount of nanoparticles that reaches the target location. This is very important because no assumptions or additional measurements – which may be invasive – to determine the optical properties of the tissue have to be performed. Reporting their results in the January 11, 2013 online edition of ACS Nano ("Quantitative Photoacoustic Imaging of Nanoparticles in Cells and Tissues"), Stanislav Emelianov, a professor in the Department of Biomedical Engineering, and his group, introduce a simple and direct method to quantify the number of nanoparticle markers directed towards a target diseased tissue, which allows for the quantification of the diseased state or helps in the development of targeting strategies. "Our method provides a quantitative image of nanoparticles in cell cultures and tissues," Jason R. Cook, a graduate student in Emelianov's group, and the paper's first author, tells Nanowerk. "This method is not as cumbersome as other techniques and preserves the spatial distribution of the nanoparticles in the tissues, where other quantification techniques do not. The method allows for quick screening of cell or tissue samples. Also multiple tissue types can be directly compared to determine the biodistribution of the nanoparticles in the body." Previously, Emelianov's group, like other teams, worked with mass spectrometry to quantify nanoparticles in tissues or cell cultures. To determine the spatial distribution of the nanoparticles they used histological staining techniques so that they could observe the nanoparticles under a light microscope. "Since mass spectrometry and light microscopy cannot be performed on the same tissue or cell sample, we had to make assumptions that two animals or two groups of cells would produce the same nanoparticle uptake and distribution," says Cook. "Of course, this assumption is not always valid because no two animals or cell cultures are exactly the same." Other investigators have developed photoacoustic microscopes that can image the presence of nanoparticles at high resolution. The UT Austin team uses photoacoustic microscope technology in combination with a quantitation method that they developed to quantify nanoparticles in cell and tissue samples. In their paper, the researchers demonstrate quantitative photoacoustic imaging with 15 nm iron nanoparticles which they quantify cells and thin slices of cancerous tissue. Study and compare molecular targeting strategies by quantifying and assessing the distributions of nanoparticle accumulation. Determine dosage if drugs are combined with nanoparticles or for thermal ablation therapy. Determine toxicity of nanoparticle by quantifying the biodistribution. 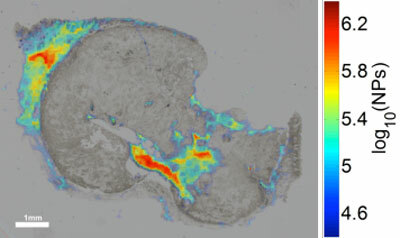 Extend strategy into in vivo non-invasive quantitation. The team's current research uses nanoparticles that do not interact with one another. Typical nanoparticles, however, such as gold nanoparticles, interact when they are in close proximity to each other. The researchers therefore plan to expand on their present work by scanning the nanoparticle-laden samples using multiple laser wavelengths to accurately quantify gold nanoparticles in cells and tissues. "In addition, we plan to extend the current strategy to provide non-invasive in vivo quantitation," says Cook. "Before we accomplish this, we will establish methods to determine the contribution form the local environment. This will help clinicians better detect and diagnose disease, and help determine dose in the case of thermal ablation or drug nanoconstructs."